Just briefly this evening I thought it might be fun to report that I have definitely found my Christmas ornament to commemorate 2012. 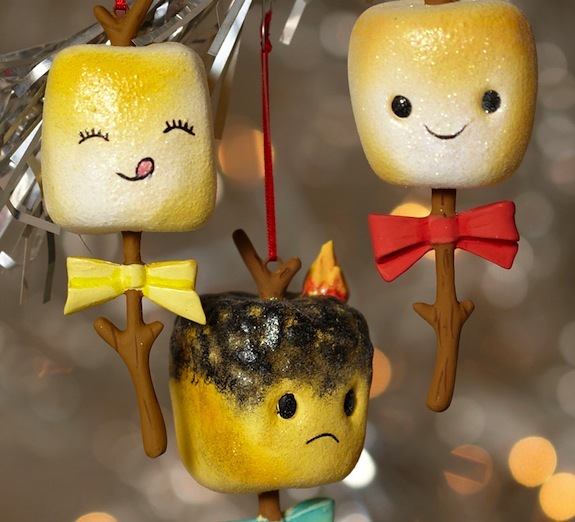 When I saw this trio of happy and not so happy marshmallows on the ModCloth website I burst into peels of laughter. I can’t tell you how many times I’ve burned my own s’more fixings to a crisp and had to beg spare marshmallows from friends and family over the years. Needless to say camping, fire, and I just really don’t mix. If you want to see some of my other favorite tree decorations then you should definitely check out this tag on my flickr account. What’s your holiday style? Do you buy many new Christmas trimmings each year or just one special item? PS: I actually found these items for quite a bit less via this seller on Amazon. I ordered them just now and will report back on the results.